What is CNNIC server certificate? CNNIC server certificate is a type of server certificate product self-developed and self-researched by CNNIC, being the first domestic product with self-intelligent property right to be compatible with all the browsers in the world. 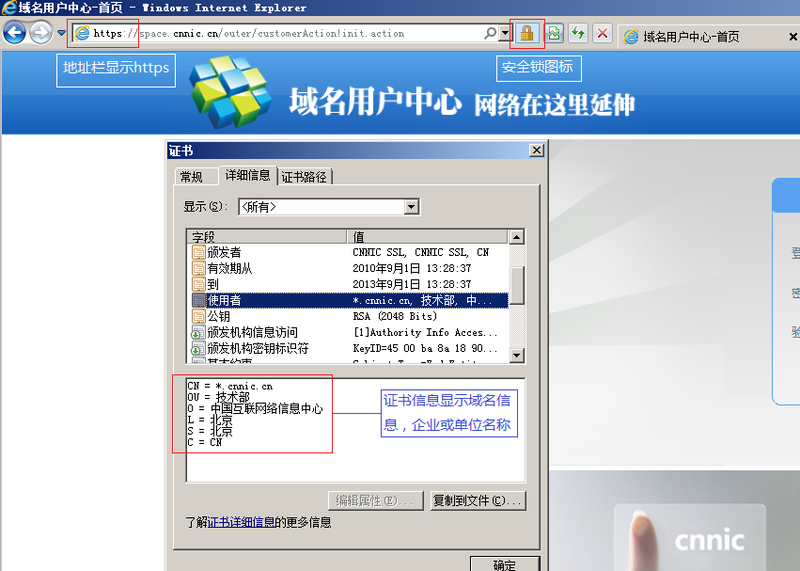 CNNIC server certificate can ensure the encrypted transmission of information between users and websites, and affirm the identities of enterprise websites through certificate verification so as to gain the trust of netizens; at the meantime, it provides a signature free of charge to help netizens identify easily the users with CNNIC standard server certificates for the purpose of further improving the function of easy identification of server certificate. CNNIC server certificate product series include standard server certificate, fast domain name certificate and EV advanced certificate. It is a simplified version of server certificate, and its internationally universal verification strategy only verifies the ownership of domain name, with domain name instead of enterprise name shown for the certificate users. However, this kind of certificate that only attests to the ownership of domain name can enable encrypted transmission of information event without verification of the identity of a website enterprise. 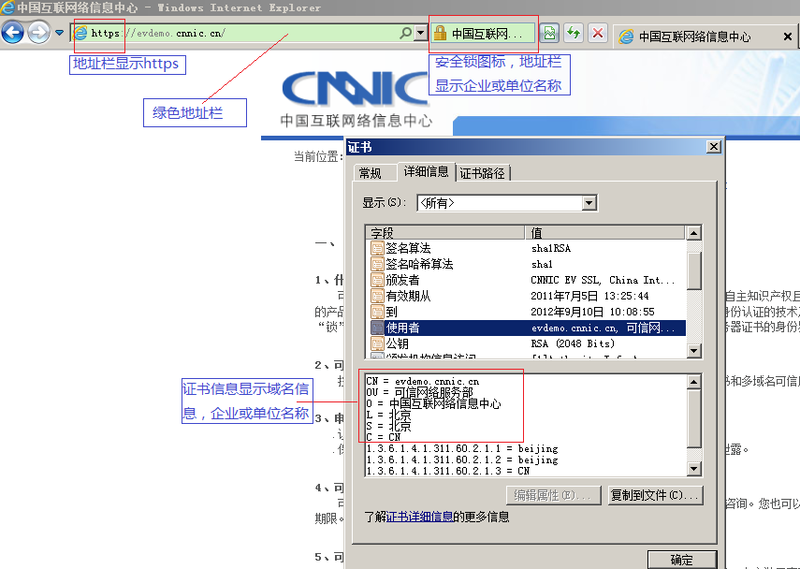 Notes: CNNIC fast domain name certificate is subject to much more stringent verification. As for .CN country code domain name users, their domain names will be examined to determine whether they have passed the real-name verification as required by the State. As for the applicants of non- .CN domain names, their business licenses and other materials will also be subject to verification. Such certificate will be conferred upon the approval of such verification materials. This certificate adopts a rigorous verification system, and such materials of the applying website enterprises as business license and other identification materials shall be verified. The certificate shall contain such information as the domain name, and the name and location of the enterprise. It is a server certificate with extended validation. Being in compliance with the stringent identification validation standard universal around the world, this server certificate boasts the highest level of security of nowadays. The websites where EV advanced certificate is deployed has an address filed in green, and the enterprise name of the website will be shown in the status bar of the browser. Websites of government affairs, electronic business, and famous e-mail service need this kind of certificate to show information including enterprise name and to gain the users' trust. For window-type industries　posing higher requirements for network security such as banking and securities, the conspicuous address field in green can be recognized easily so as to prevent website from being counterfeited.